For my entire life, I have been plagued with a horrible cough. Bronchitis is a regular occurence in my world. And once that cough settles in…. it is close to impossible to get it to release its grasp on my chest and lungs. I’ve cracked ribs and bruised kidneys with a cough that simply won’t let go. It is, in a word: Miserable. And I’m delighted to say, I have passed the propensity for this cough on to my small people. It is not unusual for the cough to apear in the Fall and still be lingering in the Spring. We sit up at night. We don’t sleep. The cacophany of coughs is the soundtrack that puncuates the space in which we live during these months. And, I always end up feeling desperate. Which means I’m always willing to try anything. And by anything, I mean ANYTHING. Prop up the bed? Check. Only sleep on your side? Check. Sit in a steamy shower? Tried it. Go outside in the cool (or cold) night air. Yes. Tried this too. Vicks on the bottom of your feet with socks. Oh yes – Been there, done that. Never mind the cough medicines and the cough drops. And then someone recommended honey. Yes. Just pure honey. I’d certainly used hot tea with lemon and honey when I’ve had a sore throat, but trying honey was a first. Now – keep my ‘willing to try anything’ mentality in mind. So, I did. And my kids did. So, I needed to know why. Studies have shown honey can actually help stop a cough in ways that some over-the-counter cough suppressents do not – even the ones that include dextromethorphan. Why does honey work? Doctors suspect there are a few factors: There is a ‘stickiness’ factor to it and its texture can help to soothe and/or lubricate the throat. As a side note, many doctors say that darker colored honey is actually a better cough combatant as it has more antioxidants. And a final note…. 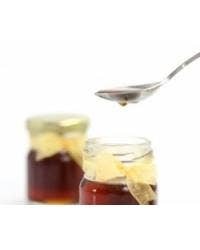 honey is not recommended for infants under the age of one because of the risk of infant botulism…..so stick to trying this as an aid in older children and adults.